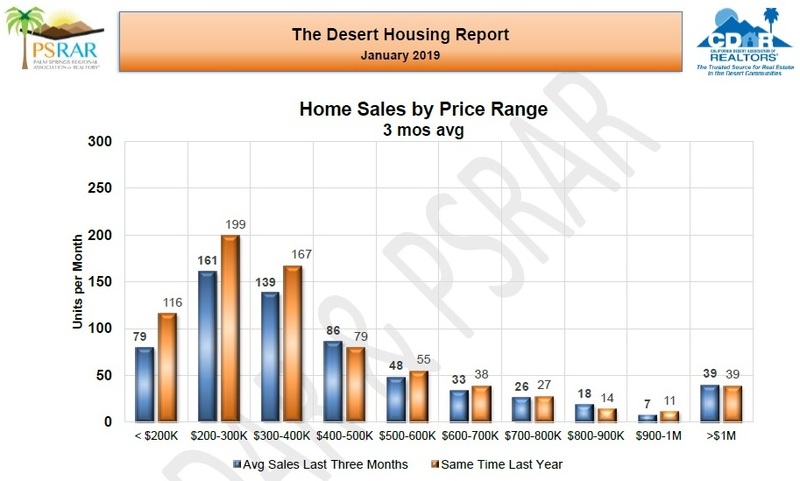 The Coachella Valley detached home median price in January was $390,000 (up 2.6% year-over year from the Coachella Valley detached home median price of $380,000 in January 2018). 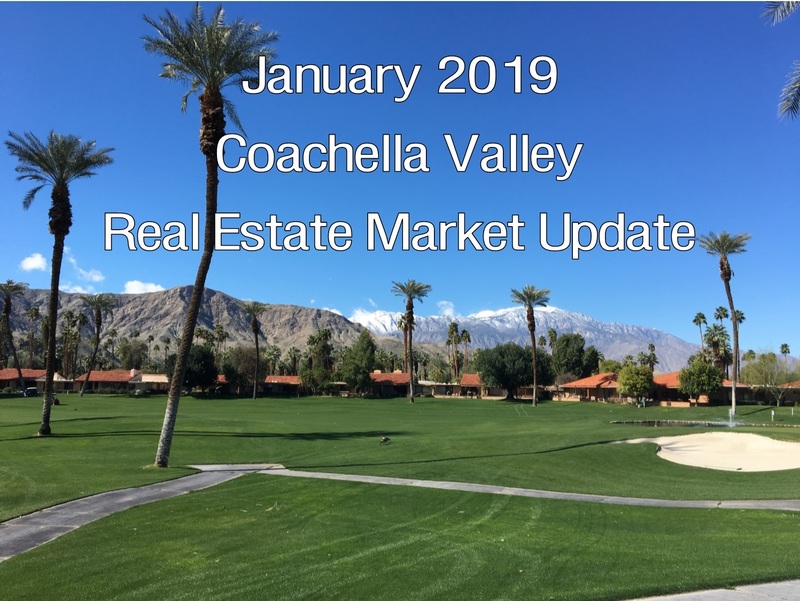 The Coachella Valley attached home median price in January was $275,000 (up 7.8% over the Coachella Valley attached home median price in January 2018). Market Watch’s analysts expressed disappointment with this price gain, since they claim January is right in the middle of the strongest seasonal period for this type of home. Market Watch’s analysts commented that the prices of detached and attached homes in these 9 cities of the Coachella Valley confirm the regional price slowdown. For detached homes, median price changes year-over-year ranged from an increase of 33% in La Quinta to a decrease of 0.9% in Palm Springs. 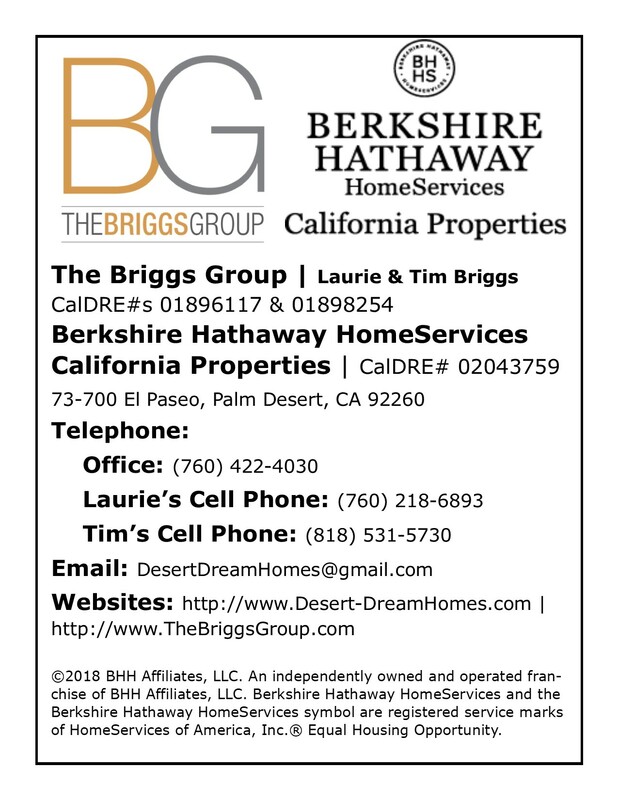 Market Watch noted that the price increase in La Quinta was in large part due to the median detached home in January 2019 being for a 2,400 sq ft home (versus a 2,100 sq ft home in January 2018). 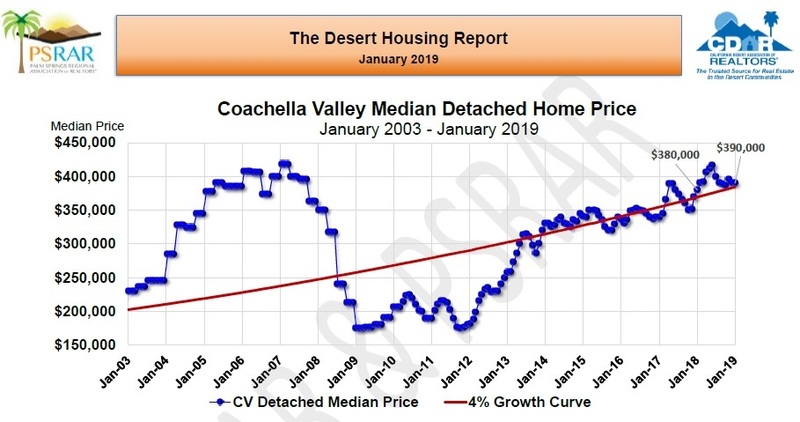 Further more, in terms of prices compared to the Coachella Valley’s 2006 highs, Rancho Mirage’s detached home median price was 32.1% below the 2006 highs, Desert Hot Springs' detached home median price was 24.4% below the 2006 high, Palm Desert's detached home median price was 23.6% below the 2006 high and Coachella's detached home median price was -22.4% below the 2006 high. 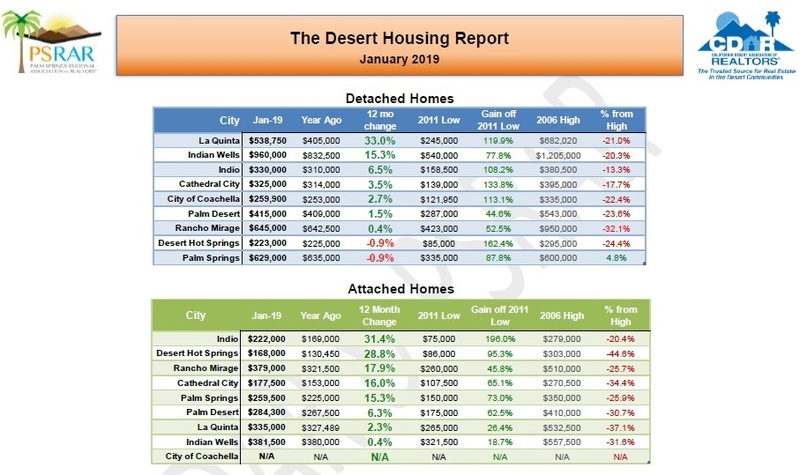 Turning to the attached home median prices, changes ranged from an increase of 31.4% in Indio to an increase of 0.4% in Indian Wells year-over-year. 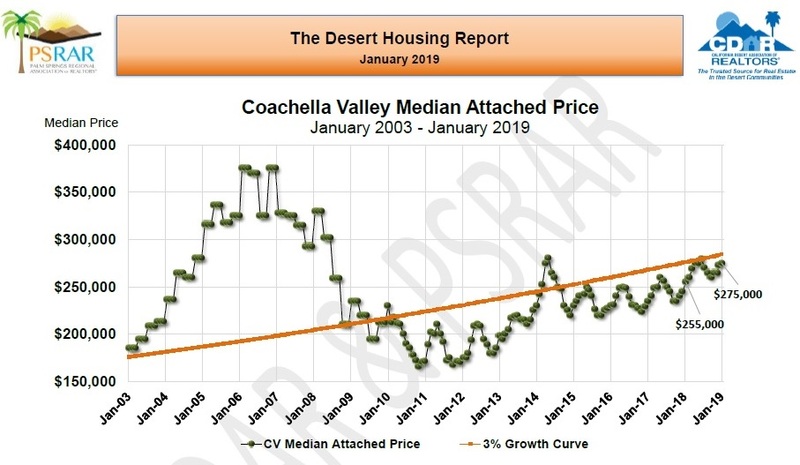 In terms of prices compared to the Coachella Valley’s 2006 highs, Desert Hot Springs’ attached home median price was 44.6% below the 2006 high, Palm Springs's attached home median price was 25.9% below 2006 highs and Indio's attached home median price was 20.4% below 2006 highs. Market Watch’s analysts pointed out that average total home sales (using a 3-month moving average) in January were 637 units per month (14.5% below the 745 units sold in January 2018). The average detached home sales in January were 422 units per month (12.4% below the 482 detached homes sold in January 2018). 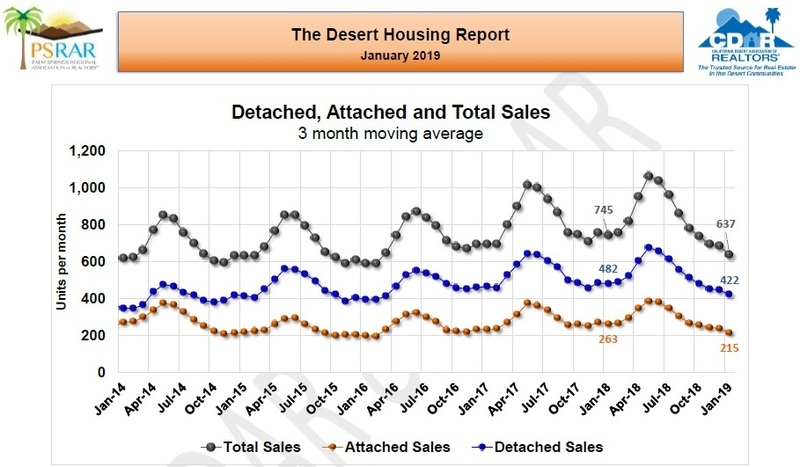 Attached home sales averaged 215 units per month compared to 263 units in January 2018. 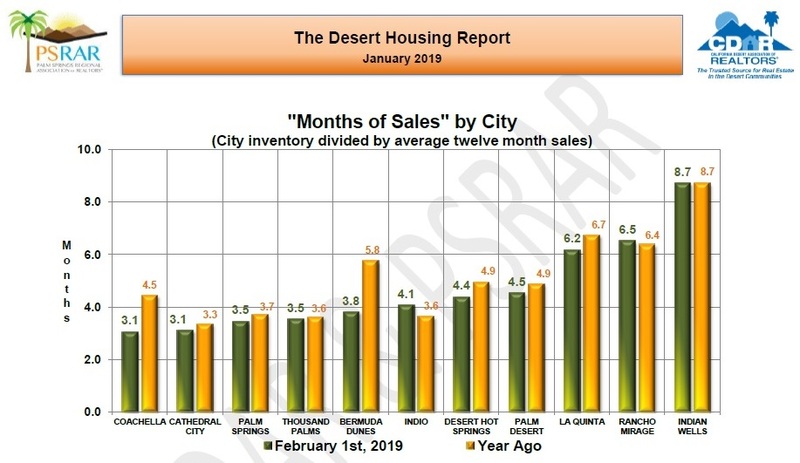 Other than Coachella (with 13 sales in January 2019 versus 12 sales in January 2018) and Thousand Palms (with 3 sales a month in January 2018 and 2019), the other 9 cities in the Coachella Valley had declines in home sales. Sales of homes priced under $300k declined in January, with sales of homes priced under $200k down 32% and sales of home priced between $200k and $300k down 20%. Sales of home priced over $1M were the same as last year. 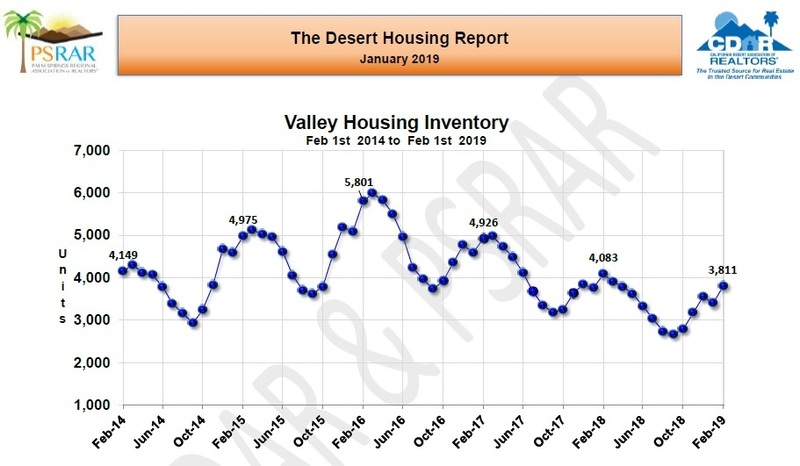 Coachella Valley housing inventory on February 1st was 3,811 units (355 less than on February 1st, 2018 and the lowest inventory level since February 2014). For comparison purposes, inventory on February 1st, 2016 reached 5,801 units. 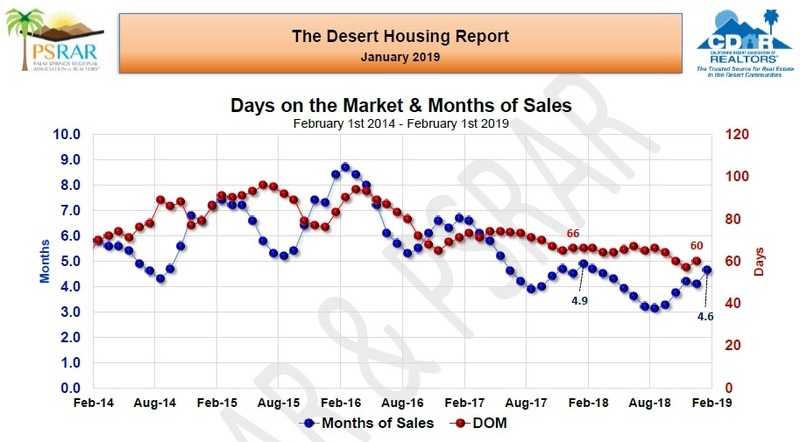 Market Watch’s analysts explained that the months of sales ratio and median number of days on the market show a well contained and strong market. Even with lower sales, the months of supply ratio stood at 4.6 months (compared with 4.9 months of supply on February 1st, 2018). Market Watch’s analysts noted that the median number of days on the market (60 days) in January was 6 days lower than January 2018. The months of sales ratios appear to be the same or slightly lower in the case of homes priced under $800,000. For homes priced over $800,000, we see months of sale ratios lower than last year. The months of sales ratios in 9 of the region’s 11 cities were almost equal to a year ago (with the exception of Bermuda Dunes and Coachella). 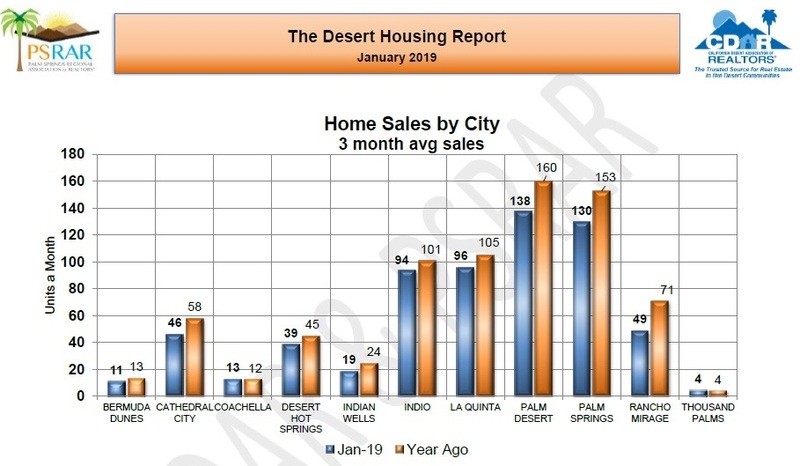 Cathedral City and Palm Springs had a low months of sales ratios of 3.1 months and 3.5 months respectively.